We had a wonderful visit at my house, Suse and I. We all sat around the table and laughed and told stories and googled all manner of topics for what seemed like hours. After a bagel breakfast the next morning, she and I hopped in the Jeep and made a trip to see the unicorns. Don't mind the air-conditioner. It is terribly warm here (101 - 106 on Saturday!). I've switched to Celsius on my iPhone so Suse and I can both understand how warm it really is. (33!) We joined a tour with the most wonderful guide. 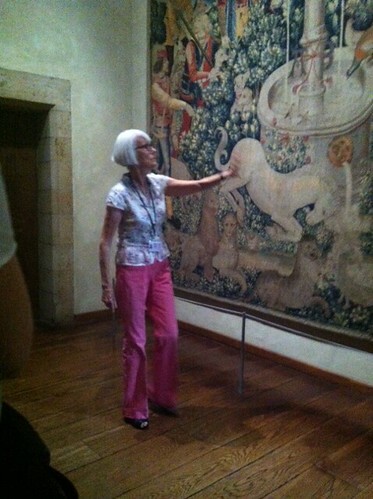 As old as the tapestries themselves! Her accent? Old, New York, Monied! She's us in 30 years! But, I am joking, of course. She was a delight and knew all there is to know about the making of the tapestries and tons of things about the plants in the gardens. It was beautiful and tranquil and, well, just about perfect. 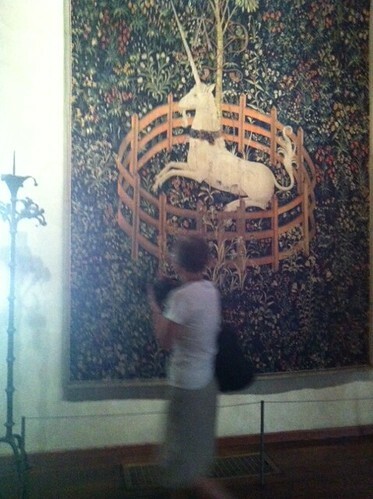 I learned a tremendous amount about the unicorn tapestries, including the fact that unicorns are nearly as rare as visiting Australians one has loved from afar. Oh, I can totally hear that old, moneyed, New York voice. 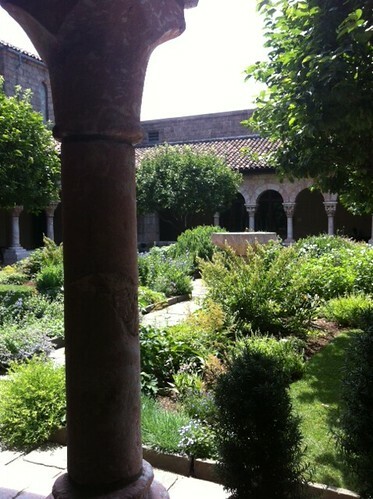 The Cloisters would be a good place to visit when it's so fricking hot. And look at Suse! Look how blurry and wee she is! Elder son left NYC at 4am today to drive to Ann Arbor. Where it is now, as of his phone call 5 minutes ago, 101 degrees. Stay cool -- relief is coming in a few days. You two are so brave. I cannot imagine going ANYWHERE in this heat. only 33C? thats a mild day for us here! I too LOVE the unicorns, I never knew they were with you, I saw some lovely companion pieces in Stirling castle where they were being ?reproduced a year or so at a time by a band of skilled craftspeople. What a lovely time, how magical to be together. So what does old, moneyed, New York like? 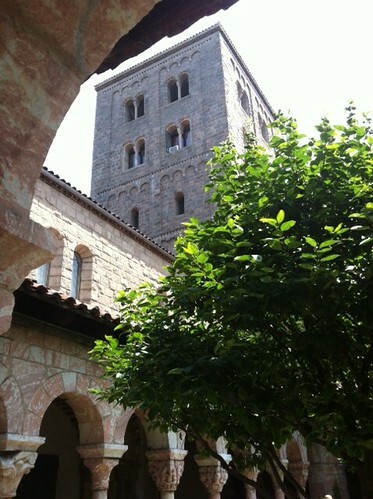 Can you give me a movie reference so that I can imagine myself there amongst the tapestries strolling the perpetually cool cloisters with you both but never looking directly at you so as not to destroy your secret identity mystique? Truthfully, should we ever meet you will have a mask. I will fashion one for your myself if I must. I should have typed 'sound like' but, hopefully, you followed my meaning. One of my favorite places in NY. I can imagine you too having a grand time!